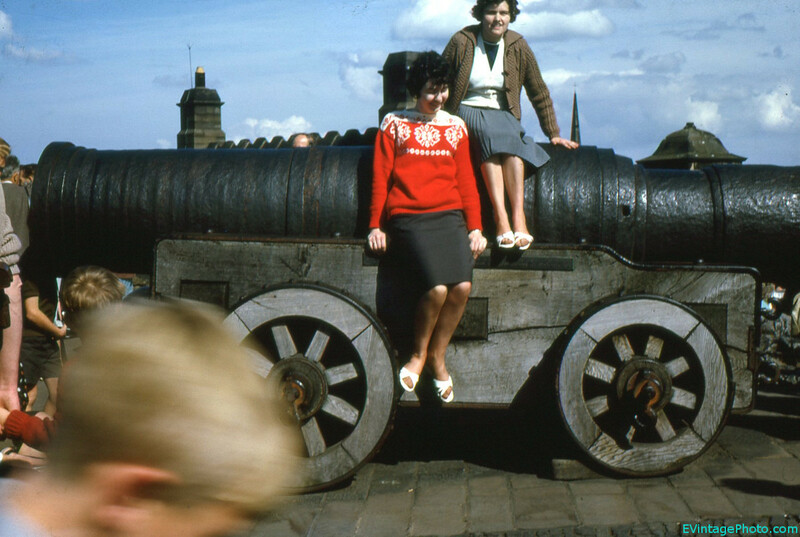 From 1965 again, we have two cute girls climbing on top of a cannon at Edinburgh Castle. Now days the cannon is probably roped off or has signs on it saying to stay off. 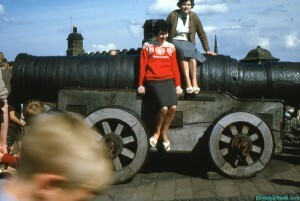 According to Wikipedia, this cannon is called “Mons Meg,” an bombard built originally in 1449. It was used in battle until the 16th century then relegated to ceremonial purposes. It burst at one occasion in 1680 and then was put away until 1754. At that time Mons Meg was taken to the Tower of London where it was stored until 1829. Sir Walter Scott and others got it returned to Edingburgh Castle. The weapon has been restored since and now participates in the annual Hogmanay celebration, although it does not actually fire.